Hang-out with Mickey and all his friends at the clubhouse, this pop up fabric tent will keep little ones entertained for hours. Quick and easy to assemble, you just need to pop it up and insert one support rod. It folds away compactly too for easystorage. Size H105, W89, D70cm…. 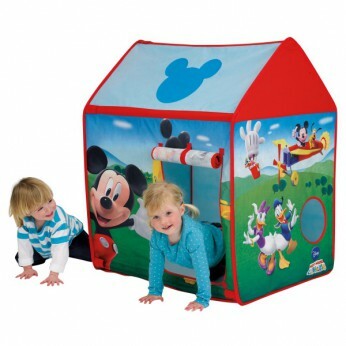 Hang-out with Mickey and all his friends at the clubhouse, there’s plenty of indoor and outdoor fun to be had with this Mickey Mouse play tent with roll-up door! Traditional design pop up Wendy House; Promotes physical activity and encourages role-play. Helps develop imaginative play; Quick and easy to assemble – pop up and insert rod. Suitable for indoor and outdoor use; Hours of active fun and adventure; Folds compactly for easy storage; Suitable for indoor and outdoor use; Folds or dismantles for storage. General information: Size H105, W89, D70cm; Weight 0.8kg; For ages 2 years and over; EAN/MPN/UPC/ISBN: 5013138601327. WARNING(S): Only for domestic use. * . This toy costs approximately £19.99 (for the latest and best prices make sure you check our retailer list for the Mickey Mouse Clubhouse Play Tent above). In our review of Mickey Mouse Clubhouse Play Tent we classed it as being suitable for ages 3 years, 4 years, 5 years but recommend you check the manufacturer specific advice before purchasing.